Spandau Ballet yesterday formally announced their comeback. All five members of the 1980s' synth pop band known for hits such as 'True' and 'Gold' united publicly for the first time in 20 years to announce the first dates of a world tour which will kick off by taking in UK and Irish arenas from October this year. 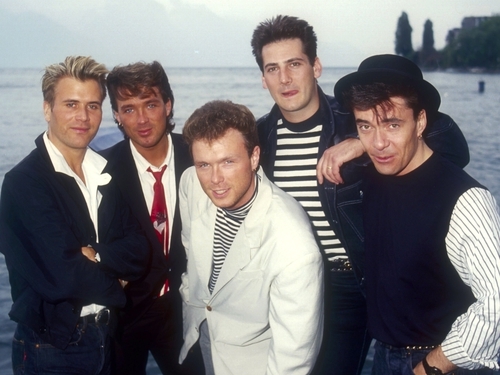 Tony Hadley, John Keeble, brothers Gary and Martin Kemp and Steve Norman made the announcement aboard the battleship HMS Belfast, on the river Thames near London's Tower Bridge. The HMS Belfast was the scene of a Spandau gig in 1980. Hadley said that the band had had a rehearsal which "sounded a million dollars". Asked what made them decide to reunite after so long apart, Hadley said: "I think it is the realisation that time is a great healer... We first met in the pub, had a few beers, the stories came up and the anecdotes and we just realised that we're great mates." Emerging from Soho's ultra hip Blitz Club in 1979 during another economic downturn, Spandau formed at school in North London. Their albums sold by the millions, and their flamboyant look and style was a fashion hit. They are re-forming after years of feuding and battling in court. The group were asked a question about royalties during the press conference but journalists were told it was a private matter. Martin Kemp compared the band's relationship with that of a family. "Families go through terrible times sometimes and they argue," he said. "But in the end we've got back together - which is the main thing." The band is set to play The O2 Dublin on October 13 and The Odyssey Arena in Belfast the following night. Tickets for the gigs go on sale on Saturday at 9am and are available from www.spandauballet.com.